Cassandra Kubinski, a friend of the show, keeps me posted on her musical performances, and I am always more than happy to pass them onto you. If you are in the area, please come out and support her and her musical friends! 2. 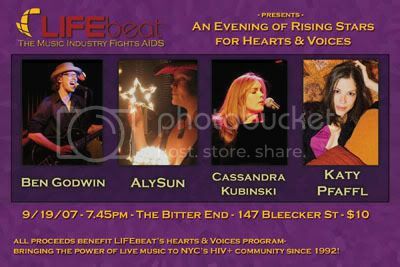 Benefit for LifeBEAT this Wednesday in NYC! 2. For years, I've played in the AIDS hospitals of Manhattan for HIV+ patients through an organization called LifeBEAT (Note from David: Thank you!!!!). This Wednesday, I rock for a cause at this very special event. ALL PROCEEDS BENEFIT LIFEBEAT, so please come and bring friends! Thank you for your generous support of LifeBEAT and of artist like me and those listed above!